Botox is a medically derived subunit of botulinum toxin which acts as an inhibitor of neuromuscular activity. Botox is precisley injected into specific areas of the face to improve the appearance of fine lines and wrinkles. Botox works by weakening the muscles of facial expression which insert on the surface of facial skin. Once the resting tone of these muscles are weakened, the pull of the muscles relax and the skin flattens out. By physiologically weakening the active muscles, wrinkles are improved naturally. 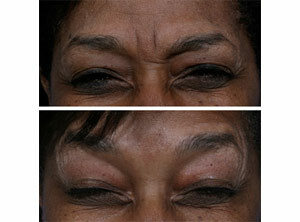 As time goes on these wrinkles will continue to soften as long as treatment is continued. This is an entirely different approach to treating the facial wrinkles. Injectable materials work by filling in a wrinkle. These fillers are not as effective as Botox in improving the frown wrinkles between the eyebrows and wrinkles at the corners of the eyes (crow’s feet). Botox can be combined with a dermal filler for greater correction. During your consultation, Dr. Steiger will inform you of the most effective way to treat your areas of concern. What areas are commonly treated with botox? Since Botox works by softening muscle acitivty, it is most effective on dynamic facial wrinkles. This refers to the types of wrinkles which are enhanced by facial muscle movement. Skin begins to lose its elasticity in the late teenage years. The facial muscles are attached to the skin. As the skin thins, its attachment to the facial musculature begins to show. These are called dynamic facial wrinkles. As time goes on, the lines can get deeper and turn into furrows. Botox is most commonly used to treat the glabella (frown lines between the eyebrows), forehead creases, and the crow’s feet (fine lines at the corner of the eyes). The effects of Botox are first seen 3-5 days after injection. This will cause wrinkles to flatten out or soften (if they are deeper). It may take up to two weeks to see the maximal effects of your Botox Cosmetic treatment. Botox is not a permanent treatment. Most patients experience approximately 4 months of correction, though some will experience results for up to 6 months. Do I have to keep getting Botox? It is recommended to repeat Botox injections every 4 months for maintenance. As you continue to use Botox, deeper wrinkles will continue to soften as dermal remodeling takes place. This is possible because the skin is no longer affected by the forces of muscle contraction and is allowed to remodel. Deeper furrows can be treated together with a facial filler to hasten this correction. As time goes on, Dr. Steiger can often reduce the dosage of Botox required to maintain the correction. Can I use Botox as preventative wrinkle treatment? Yes. In certain patients who are prone to develop dynamic facial wrinkles, Botox can by used to prevent there formation. This is especially true for patients with thin skin. If treatment is started when fines lines are first noted, it will prevent the development of deeper wrinkles. I want Botox, but am afraid to lose my expression? Botox performed properly should not get rid of your important facial expressions. The goal of Botox treatment is to obtain a natural looking improvement without a “frozen” look. Botox injections are performed by Dr. Steiger in the office, and take between five to fifteen minutes to complete. Patients may return to there normal activities immediately. We ask that you avoid rubbing your face or “exercise” your facial muscles for 12 hours after injection. Patients are often apprehensive about the prospect of pain with injection. Dr. Steiger uses special techniques and equipment to minimize or eliminate the pain of the injection. In fact, most patients are often surprised at how little they felt. There are no serious side effects associated with the use of Botox with the doses that are employed. Side effects can occur if Botox migrates from the injection sites. For this reason, it is wise to avoid massaging the area for 12 hours after the injection. Possible side effects include a limited droop of the eyebrow or upper eyelid when injected near the eye. Fortunately, if this occurs, it is temporary but may last 2-3 weeks. There have been no allergic, anaphylactic or systemic reactions associated with Botox at the dosages we employ. Pregnant women and patients with degenerative neuromuscular diseases should not be treated with Botox. Yes. Botox has been shown to help prevent migraine headaches and can be part of the treatment for migraines. This has caused some neurologists to rethink the current thought on what causes migraines. What other uses are there for Botox? Botox can be used to treat excessive underarm sweating, a condition called hyperhidrosis. It may also be used to reduce chin wrinkles, wrinkles around the mouth, and an excessively gummy smile. Botox may also used to soften an overly square jaw, a technique called chemical jaw reduction. There is a newer product called Reloxin that is anticipated to obtain FDA approval within the first half of 2009. Reloxin is made of the same type of chemical that Botox is made from. It may have some benefits in requiring less injection points and quicker onset of action. There are some reports of a longer duration of activity as well, thought the verdict is still out on this. More information about Reloxin is availalbe on the Dysport page.